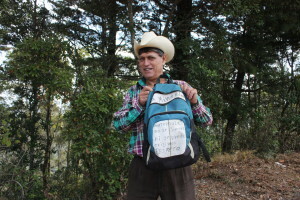 In the fall of 2015, Llan Carlos Dávila from the Diocesan Committee in Defense of Nature (CODIDENA) toured the U.S. to speak about CODIDENA’s efforts to stop the development and expansion of Tahoe Resources’ Escobal mine in southeastern Guatemala. Dávila spoke about popular education, grassroots action, and the organizing of community referenda in response to Tahoe’s arrival without prior consultation with affected communities. The mention that more than 50,000 people voted in these referenda between 2013 and 2014 against mining in their territories resonated strongly with the communities he visited. 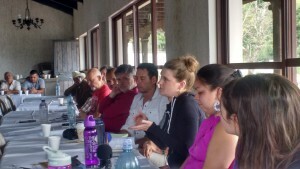 Building robust face-to-face connections with activists supporting the global movement for ecological justice, Dávila’s visit sparked reciprocity and the cultivation of horizontal relationships across the Americas. 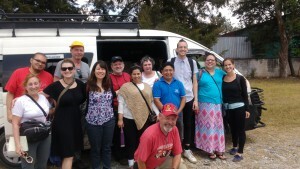 In March, NISGUA organized a 10-day delegation to visit Llan Carlos’ community and others impacted by Tahoe Resources’ Escobal mine. 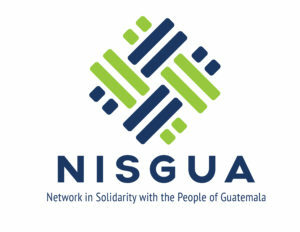 The delegation invited members of NISGUA’s base to strengthen relationships with communities impacted by the project, deepen the analysis of the current and historical context of state repression, and develop advocacy strategies in partnership with communities. 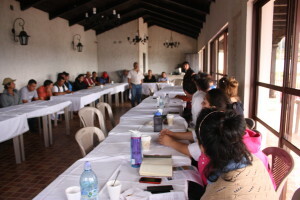 Beginning in the Parish in Nueva Santa Rosa on March 7, the delegation met with members of CODIDENA and other community representatives who elaborated on their strong and organized opposition to the mine and the severe repression that this nonviolent opposition has faced. Mirroring a nation-wide pattern of using state and private-security forces to crack down on local opposition to mega-development projects, community representatives told of confrontations with the military during nearby states of siege in 2013 and other points of intimidation during peaceful protests. That night, in small host families, delegates had the opportunity for more personal reflection, cultural exchange, and in-depth discussion about specific experiences certain families have faced in this struggle. Family members proudly showed us their homes and lands, instilling a sensory experience of what they are working to protect. Over the course of the next few days, the delegation met with the Xinca Parliament and listened to their insight into organizing as Indigenous peoples in defense of life and territory. 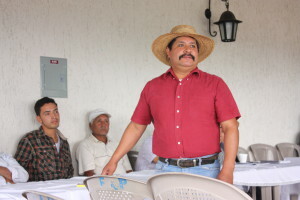 We traveled to the community of Chapas, where community members talked about the disingenuous tactics used by the company to feign support for its operations. One community member was explicit in his call for action rather than simply more words. 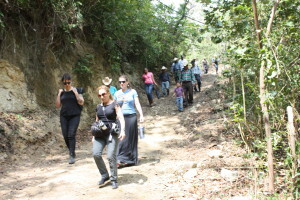 Members of the community took the delegation up the mountain of Cerro Verde to visit the source of the spring that provides the community’s water. 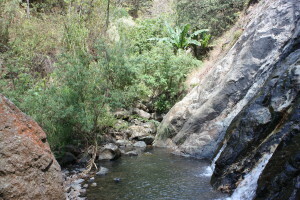 After disembarking from the trucks, we hiked up to the spring’s source, or as many say, donde nace el agua, where the water is born. Community members filled their water bottles directly from the spring, telling us that, if the mining operations expands as it plans to, this will no longer be possible—the mine will likely dry up the spring due to its exorbitant use of water in its operations. 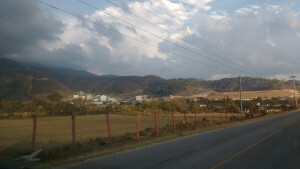 The next day, we passed by the Escobal mine en route to the nearby municipality of Mataquescuintla. While the public is restricted in getting any closer to the mine than the highway, we could see the imposing complex – and its obvious proximity to houses and crops. This dangerous closeness was emphasized by local resistance leaders as we met with them and heard their testimony. 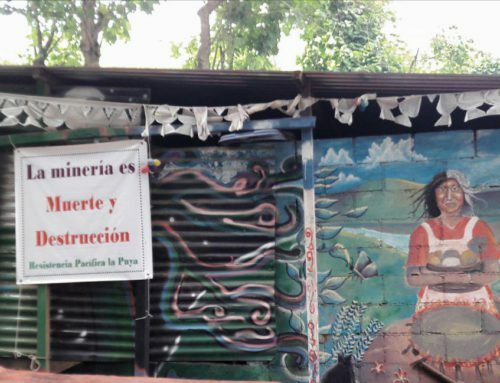 A peaceful protest outside the mine’s gate in 2013 saw seven people shot with live ammunition by private security forces, many of them from San Rafael las Flores and Mataquescuintla. We heard testimony from Luis Fernando who was 17 years old at the time when he was shot in the face during the protest. 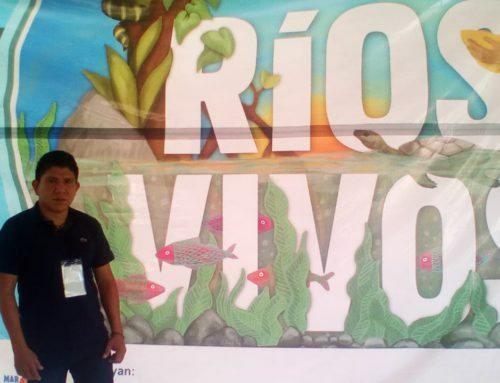 After multiple facial reconstruction surgeries, he is still recovering from the attack, but continues to act as a youth leader in the community’s anti-mining movement. We also heard powerful testimony from Irma Pacheco whose partner, Alex Reynoso, has been shot on two separate occasions over the last two years. 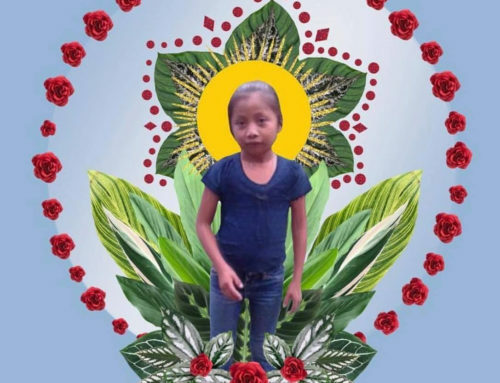 Their daughter, Topacio, was a well-known youth activist and was killed in the first attack in 2014. Hearing first-hand about the insidious ways in which peaceful protest has been met with deadly force—how families and communities have been forever altered by the violence and criminalization waged in the name of “development”—we as delegation members found ourselves, too, transformed by the experience and committed to responding to calls for action. Bookending our visit to the communities, we explored the Casa de la Memoria (House of Memory), an interactive museum created and supported by the Center for Human Rights Legal Action (CALDH), and toured the National Police Archives, an internationally-funded human rights project tasked with cleaning, archiving, and digitizing over 80 million documents recovered from secret national police files. We also met with a representative from the Center for Independent Media, learning more about the historical context of state violence and repression and how the Escobal project fits into a larger system of extractive energy, together with hydroelectric dams, sugarcane and African palm production. Through those visits, we saw how the legacy of that impunity and violence continues on in the repressive tactics of the government that currently target communities working in defense of their culture, life and territory. 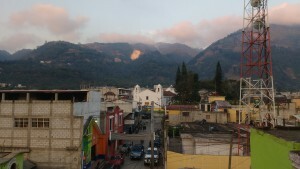 Tahoe Resources’ Escobal mine, for instance, has depended on private security forces, civil police, and the Guatemalan military to guarantee its construction, continued operation, and its planned future expansion. From the very outset, a key objective of the company’s militarized security plan was to suppress opposition—which they have carried out using violence, deadly force, and the criminalization of movement leaders. Guatemalan activists liken this contemporary ‘counterinsurgency’ and its military intelligence tactics to the strategies of repression used during Guatemala’s 36-year internal armed conflict. Indeed, on both sides of the mine, military bases have appeared, serving as a constant reminder of their government’s priorities. 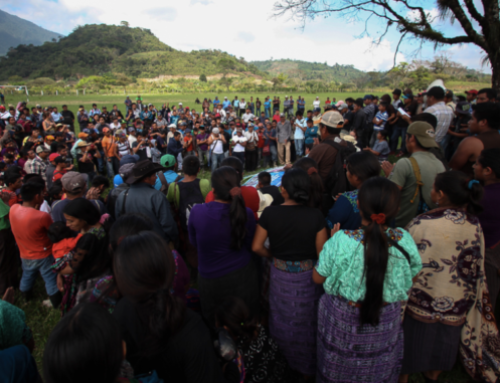 During the delegation, communities in resistance to Tahoe’s Escobal mine constantly reminded us that they are in a struggle to defend life and the future of their children. 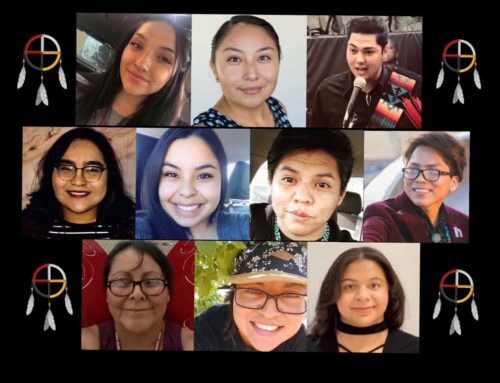 In multiple strategy sessions, organizations called on the international community to help raise the voices of impacted communities and stand with them as they denounce Tahoe’s ongoing abuses as they operate in disregard to local consent. 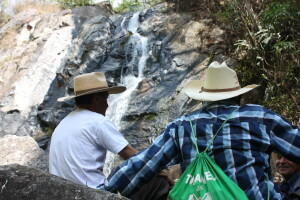 NISGUA provides international accompaniment to many of the communities and leaders in resistance to Tahoe’s project and the imposition of other mining projects in the country as one concrete way to help dissuade threats communities receive as they demand that their human rights be respected. We invite our base to continue to reflect on the knowledge gained through these spaces that serve to gather information and express solidarity, and continue to stand with communities as they speak out against the imposition of transnational resource extraction projects. For more information on Tahoe Resources, visit tahoeontrial.net.